Sandy beachfront with mountain resort, pets welcome, perfect for casual family fun! Our family of 12 (plus 7 more at a nearby house) plus two dogs stayed the week in mid-summer 2018, and this was the gathering house. House is spacious - enough seating for all to gather in different groupings inside and outside. Open concept dining with big table and living room with big sofas. Relaxing screened in porch has table for 6 plus random chairs and coffee table. We brought a folding table and set up a coffee bar there. Deck needs more comfy seating but has lots of bench space and a nice gas grill. Lower deck is very lovely, too - just bring some lounge chairs. Two water-facing bedrooms are big, comfy, with gorgeous views. Screen door in twin room already broken so don't spend time trying to fix it - the frame and door are different sizes and it's on their work list. Little bedroom sweet for little ones, or those who want quiet sleeping space. Upstairs master bedroom has no water view but is large and has large bath and is perfect for anyone. Kitchen is small and dishwasher not working properly, but otherwise fine and has direct access to master bathroom. Downstairs bath has a shower and sauna! Waterfront is fantastic: small sandy beach, huge shallows, has a wooden raft with ladder out in deeper water, mooring, older picnic table and chairs, hammock, fire pit, canoe, plus lots of shady space for games and fun. Bring rope to hang beach towels down there. Really is awesome! House is walking distance to trail head up to the summit of Pleasant Mountain, or a prettier hike with persistent views is South Ridge trail, a short drive away. About 15 minutes away is quaint little Bridgton village with cafe's, restaurants, shops, art gallery, museum, ice cream, Hannaford Supermarket (much better of the two markets), more beaches and trails, Saturday farmer's market, and much more. Reasonable rates & two dogs welcome! Owners own a compound with neighboring houses so someone is usually right next door to help or if questions. Owner is the sweetest person ever, seems to truly enjoy sharing her home with strangers so let's help her keep it open! This is a fantastic place to stay and we hope to return soon! This was our first stay at the Point House. When everyone was there, our party consisted of six grandchildren, six adults, and two labradoodles. Several adults were only able to stay a couple of days due to work, but on those days, there was plenty of room for all. We loved the screened-in porch and ate most of our meals there. The living area was spacious and had plenty of seating. There was a nice gas grill on the deck, which we used almost nightly. We enjoyed several campfires at the fire pit, making s’mores and doughboys. The beach area was wonderful with a gradual entry into the water for little ones and seniors. The water was clear with a beautiful sandy bottom. The float kept the older kids happy, and one grandson learned to swim and dive while we were there. Fishing was the main attraction for the oldest grandson, who would head out in his kayak every morning, only to return for meals and rest. The dogs sure had fun, too, and didn’t want to come out of the water. We had a great time, and we will be back next year! We loved our vacation!! The house is perfect for a family. The beach with the sandbar is great for the kids. This was our second year there and we will be going back! Beautiful location and large enough for the whole family with friends. Great place! This is a great place for family members and pets to enjoy a week of relaxation! Human ages ranged from 16 - 75 and all were happy here with plenty of room for time together and individual space. Many thanks! 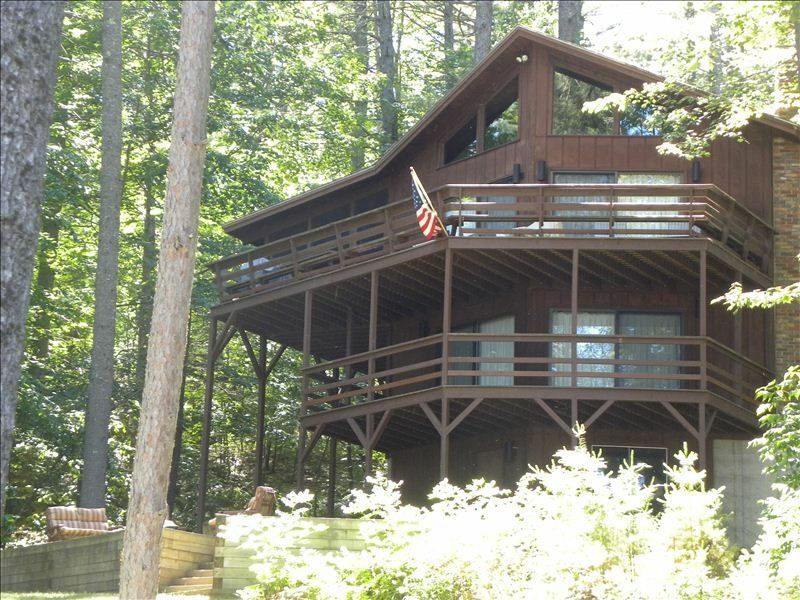 Very nice lake house, well stocked kitchen, secluded property with private sandy beach. Perfect for small children.